Since their discovery in 2002, scientists have struggled to understand Fast Radio bursts—high-energy pulses that originate from galaxies billions of light-years away. Though only a handful of these radio blips have ever been detected, new research suggests they could be a ubiquitous fixture of the cosmos, flashing about once every second throughout the observable universe. It’s an intriguing conclusion, but one lacking in observational data that would lend it support. Scientists still aren’t sure what causes these powerful bursts of radio emission. 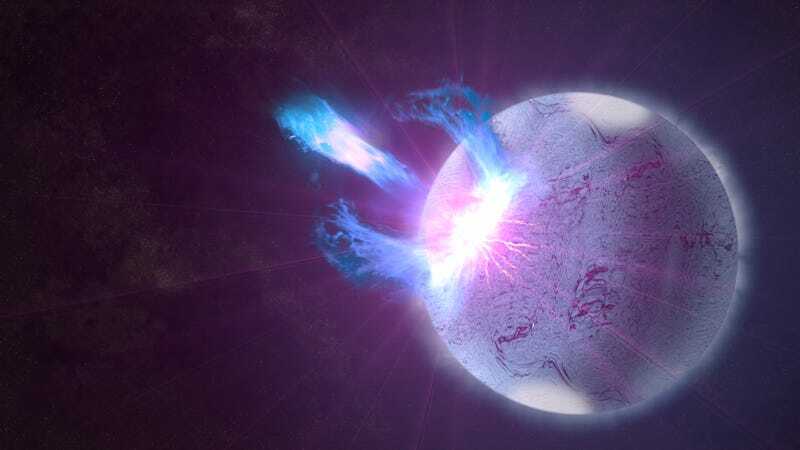 The most popular explanation is that they are caused by rapidly spinning neutron stars with extraordinarily strong magnetic fields, known as magnetars. Much more speculatively, these bursts could be produced by an advanced alien civilization’s antenna ray for lightsail propulsion. What we do know is that at least some FRBs are not produced by catastrophic events, such as a supernova explosion. We know this because of a Fast Radio Burst source known as FRB 121102—an object that’s producing FRBs with surprising regularity. Last month, scientists working on the Breakthrough Listen Project—a 10-year mission to search the skies for signs of extraterrestrial intelligences (ETIs)—detected 15 new FRBs from this single source. In total, only 23 FRB sources have been observed so far, pointing to the difficulty of detecting these strange signals. That’s obviously a lot—a conclusion that, if correct, would upend what we know about FRBs. Fialkov, who led the study, worked under the assumption that FRB 121102 is representative of all FRBs, an object located in a metal-poor dwarf galaxy about three billion light-years away. “In our paper we calculated the rate of FRBs in the entire volume of the observable universe and found that it can reach once every second,” Loeb told Gizmodo. Loeb says that if we can study even a small fraction of the FRBs like FRB121102, those that occur on a regular basis, we should be able to unravel their origin and answer myriad other questions. Andrew Siemion, Director of Berkeley Research Center, agrees with the conclusion of the new study, that FRBs are probably happening all the time. He also thinks determining the rate of FRBs could help to unravel celestial mysteries. But Emily Petroff, a postdoctoral researcher at the Netherlands Institute for Radio Astronomy (ASTRON), says it’s still an open question as to how many FRBs are going off and how often. Petroff says that only a small fraction of FRBs may be like the FRB 121102 repeater, which if true, would bring the numbers estimated in this paper down significantly. “This paper makes an interesting point about what the sort of maximum number of FRBs going off at any given time might be, but I think the main takeaway is that our knowledge of FRBs is too limited at the moment to know if these distributions might be correct,” said Petroff. Clearly, what’s needed are more observations. And as Loeb points out, we’re already—or soon will be—in the possession of tools that are capable of findings more FRBs, including the recently deployed Canadian Hydrogen Intensity Mapping Experiment (CHIME) and the soon-to-be-finished Square Kilometer Array (SKA).